Earlier this year, Simplicity contacted a few sewing bloggers asking them if they’d like to host a giveaway of two of their patterns, and I wanted to be able to host a giveaway here at Thread Carefully, too, so I contacted them and asked them if they’d send me some patterns, and they were only too happy to oblige! First up, Simplicity 1612 (size AA 10-18) – a pattern specifically designed for knit fabrics! I love the cut-out back on this design and the plunging front, and the other view is really cool and quite unusual. It looks awesome as a maxi dress, or a knee-length dress. The Amazing Tara Cat recently made this dress – you can see her maxi version here if you haven’t already. It is lovely! 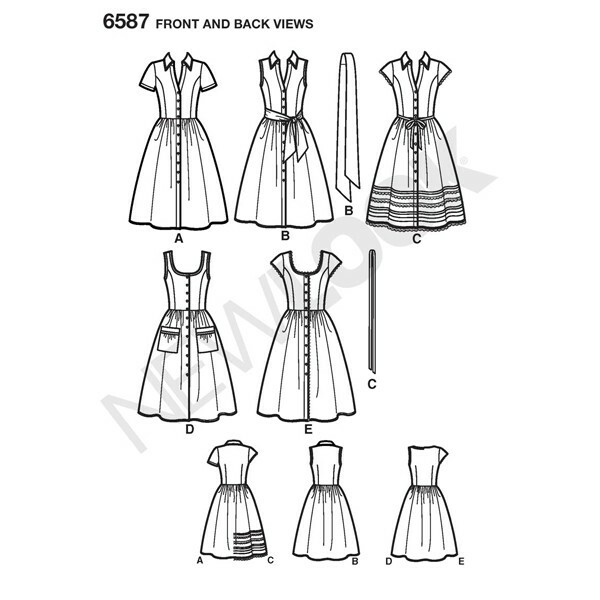 Next up is New Look 6587 (size A 8-18) – a simple shirt dress pattern with lots of cute variations. This is a really versatile dress and shirt dresses are just a classic wardrobe staple in my opinion, whatever your style. 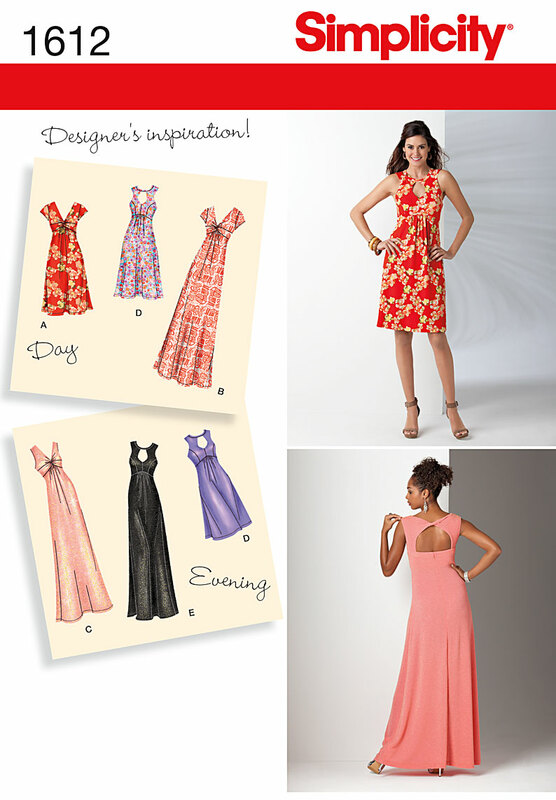 So – what do you need to do to win one of these patterns? Leave a comment on this blog post telling me which pattern you would like to win, and what occasion you might wear it for (or tell me where you would wear it). You can do either of these, or both to double your chances! I’ll post anywhere in the world. Please make sure your contact details are attached to your profile thingy so that if I pick your name I can contact you easily. The giveaway closes a week today, on Friday 20th September, at 21:00 London time (GMT + 1:00). I would love the shirtdress! It is a classic indeed, and I already have a few others planned, but this one would be a welcome addition! I really like the new look pattern! I would wear that dress everywhere, I love to wear dresses to work, and model A would be perfect. Thank you for the chance to win! I would love the New Look shirtdress! I think a shirtdress is so versatile…wearing around the house on the weekend or in crisper, classic fabrics for work or church! I’m a stay-at-home mom and I love clothes that can make me look pulled together with very little effort! Good luck to all and thanks for this fab giveaway! I would love to win the New Look 6587. It is perfect for my winter holiday wardrobe. I would love to win the new look pattern. I’d wear it to work. I love the shirtdress and have plans to make one with a mini houndstooth I got recently in a fabric swap with green buttons. I’d love the shirt dress pattern please – always looking for the perfect shirt dress pattern! I would make a polka dot version which would be for smart everyday wear, worn with my clogs. Thanks for doing this, it’s made me sort out my twitter account, which has been on my mind for ages! I would love the shirt dress, have loved the idea of making one of these since I started sewing and love version E! I like the idea of a heavy red version for Christmas…thinking ahead…or a grey with brown tartan for autumn….ooooo I’m going on the hunt for some! 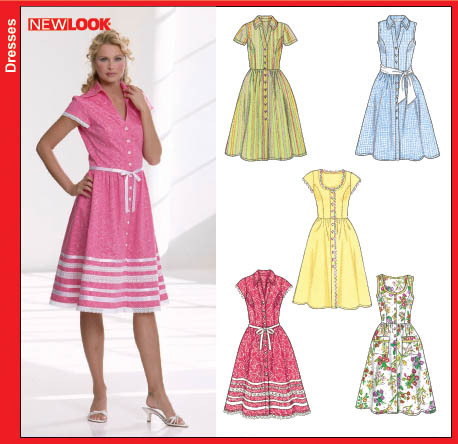 I would love to win the simplicity pattern 1612. I have just started to sew with knit and I am always looking for nice knit patterns, so tis one is perfect! I would like to make the dress for Christmas – with all the eating going on the jersey will at least stretch over the belly, hihi! I would love the New Look pattern, very retro! I might just have to do a Mad Men Halloween theme party and wear this dress, it’s very Betty! 1612 looks like the perfect holiday dress! Thank you so much for the opportunity to win one of these beautiful designs. I am really interested in the shirtwaist dress as my wedding next year is a retro garden party theme and myself and my sisters are D.I.Ying the bridesmaids gowns. We all settled on a shirtwaist with simple lines and full skirt, each in a different colour (trying to settle on a colour with three very opinionated sisters was a nightmare!!). 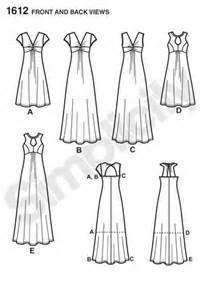 This dress pattern is pretty much exactly what we were hoping to find!